We don’t ship primates to laboratories and laboratory suppliers at the moment and will not ship them in the future. The announcement comes after PETA notified the company in April that an animal experimentation journal reported that Japan Airlines was actively involved in the transport of monkeys from the Philippines, and possibly other locations, to laboratories where they are likely imprisoned, cut into, infected, and killed. Japan Airlines joins virtually every major airline in the world in banning these cruel shipments. 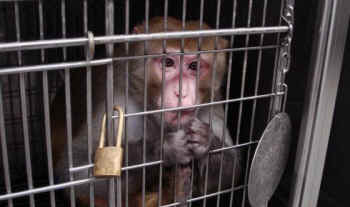 Air France and Charter Airlines continue to transport live animals to vivisection labs. Sign here to tell them to STOP.